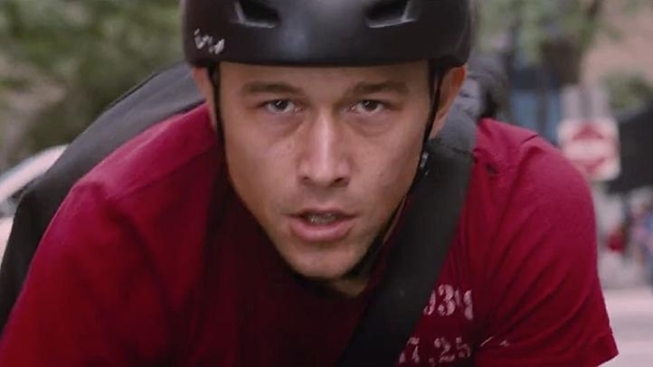 We loves us some Joseph Gordon-Levitt, so we're very much looking forward to "Premium Rush," even if it looks to be a big-ish budget thriller about bike messengers. "Premium Rush" stars JGL as a bike messenger who finds himself in possession of an envelope that a dirty cop, played by Michael Shannon, is desperate to get his hands on, leading to a city-wide race against time. The film was directed by David Koepp, who co-wrote it with John Kamps, his collaborator on "Ghost Town." Like most folks in New York, we live in fear of bike messengers, the city's most aggressive and unapologetic adrenaline junkies, a breed of people who attack the grid with a sense of purpose and entitlement that makes mere mortals leap back from the curb fearing for their safety. We've literally watched a bike messenger mow down a pedestrian who was in a crosswalk and then cuss her out. So the idea of setting a thriller in their world makes sense, on a certain level, and we're kinda surprised it's taken this long for a film like "Premium Rush" to get made. But to be honest, if this film weren't starring two of the most talented and interesting actors in Hollywood, we'd probably take a pass. But it is, so we'll be ready when "Premium Rush" opens Jan. 13, 2012. Joseph Gordon-Levitt stars as a New York City bike messenger who finds himself in possession of a package that a dirty cop, played by Michael Shannon, is desperate to get his hands on. Opens Jan. 13, 2012.